Power meters are to performance cycle training today what heartrate monitors were in the 1990’s. Simply put, if you are not using a power meter to train, and using it properly, you are not training to your potential. While a power meter that is not used properly can become little more than an expensive speedometer, a power meter that is used well can be an incredibly informative tool. A power meter is a tool that can elevate your riding and help you understand your metabolism and technique in ways that required a physiology lab in the past. A power meter is also like owning your very own wind tunnel as it can be used to analyze the aerodynamics of your equipment and position more effectively and realistically than an actual wind tunnel. While a good coach is the best way to learn how to use a power meter effectively in your training, it is the job of a good shop to make sure you understand the technology that is currently available so that you can choose the system that is best suited to your needs. There are almost innumerable power meter options available on the market today. It is not our interest to review and compare every available system or discuss every nuance (there are other sites that do this well already). Instead, this part of our site is designed to provide an understanding of the different types of power meter systems and to highlight what are the most important benefits and considerations for most riders to consider before choosing a power meter. The more informed you are with practical knowledge on the options, the better a decision you can make for your individual needs. You will find links below to overviews of some of the most common power meter brands available through dealers like Fit Werx. Below these links you are descriptions of the key features that most cyclists find to be most important when choosing a power meter. Changes in power meter technology frequently outpaces our ability to update our articles. Furthermore, there are some finite features that a small percentage of riders value that we don’t spend much time discussing in our articles. Don’t hesitate to contact us with questions. Fit Werx has been selling power meters since almost the turn of the century and are happy to share our experience and any of the latest developments. For the purposes of cycling power meters, we refer to accuracy as the consistency of a unit on a day-to-day basis. Are the results from a week ago comparable and relative to the results from today? A power meter’s primary function is to provide functional information and thus accuracy/consistency is the most important function and the one we weight the heaviest. Effective training requires that the results be consistent session to session and this category looks specifically at how little variance the meter allows. Accuracy today is usually between 1.5% and 2% with the exception of SRM who offers lab versions of some of their power meters with accuracy to 0.5%. The highest tech piece of equipment in the world isn’t worth much if it doesn’t work. Reliability as well as how often batteries need to be replaced and firmware updated are all parts of your experience with a power meter. Finally, how responsive, supportive and stable the company behind the product is of significant value as power meters are complex and not flawless. Advocating for our clients in the case of an issue with their power meter is one of our key “after the sale” roles as a dealer and we have developed strong relationships with the power meter companies we recommend most frequently for this reason. The least expensive power meters are usually single sided; fewer strain gauges almost always mean a lower price. Single sided units usually measure power on one side and double it, which will provide data that is relative to the unit and accurate for analysis and training for the vast majority of people. However, if you are interested in your “true” power numbers and/or you are working on trying to resolve a left/right dominance issue, dual sided power units provide additional data and will read closer to your actual “real” power number. Left/Right power balance is available as a calculated data set in the crank spindle/spider based systems while two-sided pedal based systems actually send data from both the left and right sides. With the pedal based systems, if you start with a lower priced single sided system it can be upgraded later to two sided for additional functionality. Beyond providing L/R power balance, Garmin offers detailed “Cycling Dynamics” functions like spin efficiency and platform balance via the Garmin Vector 2″ power meter and a compatible Garmin computer head unit. While other systems that independently send left/right power data (PowerTap P1, Look Keo Power Pedal) have the ability to provide such data, Garmin has not supported it with any other power meter than the Vector 2 to date. Companies like PowerTap are working on their own version of “Cycling Dynamics”, but, as of late fall 2016, it is unknown what form this will take or what displays it will be compatible. On a related note, the information provided by Garmin’s Cycling Dynamics functions appears interesting and can potentially be used in some finite bike fitting analysis applications. However, how to use the information for long-term training benefits has yet to be discovered and thus its value for many riders is debatable. Outside of price, compatibility and limitations of a power meter’s design are the biggest variables that determine which power meter makes the most sense for you. Compatibility and limitations refers to issues using the unit with certain frames or components. We list some of the most common limitations to be aware of in each product’s page, but it is important to note that this is a constantly changing list as new options and designs are added, so contact us for the most recent information. For many riders, this is one of the more important areas to understand as each unit has its benefits and compromises. 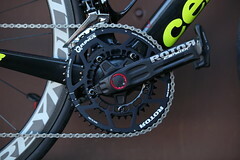 This used to be a very important set of variables when selecting a new power meter as the power meter would often only work with one computer – the one that was made by the same company. However, now that virtually all power meters are ANT+ compatible, you can use computer displays from aftermarket manufacturers like Garmin with almost all units. Thus, the computer head you select and the power meter you use can often be independent decisions. This is great news for power meter users. This article is not about selecting a display for your power meter. However, some basic things to keep in mind when selecting a display include how easy is to get where you want in the display, how much control you have over what is being displayed, how big and clear is the view, how many screens are available in the display, whether you have GPS functions and how adjustable the data recording options are. Displays have come so far in the past few years that even basic ANT+ displays often offer a host of control and display options that the top of the line did not five years ago. We suggest that you choose the ANT+ power meter you want first and then choose the computer head that provides you with the display and functionality you want separate as you no longer need to be restricted by brands or models as any ANT+ power meter will work with any ANT+ computer head. The one caveat to this is that if you want to use a BLE (Bluetooth Low Energy) computer head (like Polar), you’ll want to shop carefully as not all of the options are currently BLE compatible. 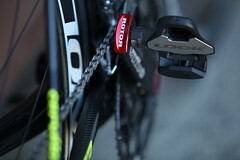 Power meters usually add some weight, so it is worth knowing how much and where the weight will be added. Depending on the brand and model, power meters can add as little as 20 grams or as much as 200 grams to the weight of your bike. Some power meters are almost as easy to install as a pair of pedals while others are more involved. Either way, all the wireless units have become significantly easier to install than ever before. 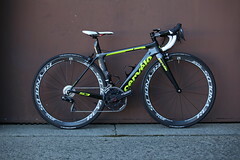 It is important to note that some units are easier to switch between multiple bikes than others and that checking crank compatibility between frames is necessary with all crank based systems. Some pedal based systems require precise torque, calibration and alignment settings when changing between bikes while others (PowerTap P1) require little more than an Allen wrench to take the pedals off and reinstall. Don’t hesitate to contact us to talk through this if you have questions. While the download software you use is very important to your end satisfaction with the units, it is important to note that there is aftermarket software available that is frequently better than what comes with any of the units – CyclingPeaks software is a good example. Also, ANT+ has allowed many different computer heads and download options to be compatible with each unit, so many of the differences in computer heads from the manufacturer are not as important as they used to be as you can use any head unit you would like from brands like Garmin or PowerTap. For these reasons, we don’t spend as much time discussing this category as we used to and we often recommend choosing a ANT+ compatible unit and then selecting a separate computer head (or heads) that suit your needs well. This being said, BLE (Bluetooth Low Energy) compatible computer heads are becoming more common. Some power meters are capable of feeding to both ANT+ and BLE computer heads. Regardless, many power meters depending on smartphone apps via Bluetooth for firmware updates and adjusting some system settings. If you are not interested in using a Garmin computer head, compatibility may be worth your time to pay attention. Strain gauge b ased systems were the original method of measuring power and remain the most common and accurate method of measuring power today. Strain gauge units are also by far the most popular. Strain gauges are usually small metallic wire grids whose electrical resistance varies proportionate to the amount of resistance (strain) put against them. The number of strain gauges in combination with the materials, construction and alignment of the unit, determines how accurately a device reads. The pluses of these systems are that they can have a high degree of accuracy, can be some of the most reliable, and offer multiple locations of power measurement. The potential drawbacks are that strain gauges are not cheap and the electronics must be very well sealed to provide reliability. With few exceptions, just about all of the true (non-virtual) power meters are now strain gauge based, but where they locate the strain gauges varies markedly. Optica l sensor based systems use wave sending sensors in combination with perforated discs to measure distortion in a known variable (like a bottom bracket axle). In the case of a power meter, the perforated discs can be attached to the bottom bracket shell and the sensors can be attached to the bottom bracket spindle. When load is placed on the axle through pedaling the sensors twist and distort in relation to the perforated disc and the distortion is measured and converted to watts for the rider. Optical sensors have little to no mechanical wear and thus should be reliable and consistent once installed. Ergomo was the primary optical sensor based system, but distribution and fabrication issues plagued the idea and Ergomo has left the U.S. market. Optical sensors remain a good idea, but one that has not been executed to its potential. Vibr ation monitoring systems convert vibration into wattage through sensors and calculations based on variables like speed. Polar’s system uses vibration monitoring and the system consists of a magnetized sensor that mounts to the chainstay. This sensor detects vibration changes in chain tension and combines this information with some measured variables on the bike to calculate power. The benefit of this type of system is that it is inexpensive and it will work with some existing Polar units. However, it needs to be considered that the system is not as accurate as some of the other methods and mechanically it can be challenging. Equation based systems calculate wattage by monitoring a variety of contributing forces and then using good old physics to calculate the end result. For example, by combining all the forces that a cyclist must overcome (wind, rolling resistance, gravity, inertia…) and combining this information with the rider’s speed and other environmental factors, wattage can be determined. The more accurately all the different variables are being monitored, the more accurate the end result. 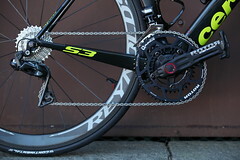 By creating a unit that adds in the variables that are not currently being monitored (wind, for example) with current technology, you can have a power meter that weighs about the same as a cycling computer and does not require any mechanical hardware outside of what a cycling computer usually consists of. This means a simple and inexpensive system. Unfortunately, the potential drawbacks are that some of these variables can be difficult to monitor consistently (like wind…) and accuracy can be compromised if the input information is compromised. 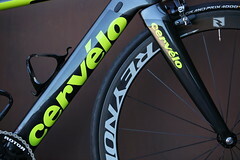 iBike and CicloSport use an equation based system. We do not carry or recommend the CicloSport because of chronic quality problems. Contact us to discuss purchasing a power meter.